Not inkjet. Not laser. The HP PageWide Pro 577dw offers the speed of laser printers with a lower cost per page and lower total cost of ownership. 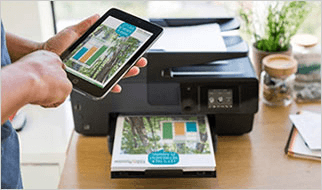 With a best-in-class print speed of 70 pages per minute, this color all-in-one printer is ideal for small and medium businesses that require fast, high-volume, two-sided duplex printing and scanning wireless and mobile connectivity and best-in-class security. Exceptional security features include secure boot and secure code integrity validation. Main functions include: Auto two-sided color printing and one-pass scanning, copy, fax, wireless printing. 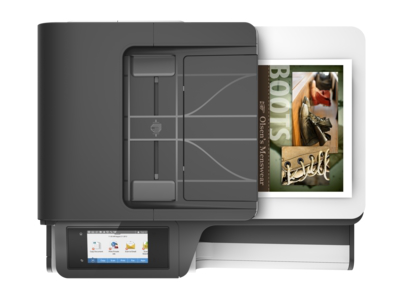 Mobile printing with Apple AirPrint, 4.3” color touchscreen, and best in-class device and network security. Print speed and duty cycle: Drive productivity with the fastest printer in its class - first page out in as fast as 6 seconds & print up to 70 pages/minute and a monthly duty cycle of up to 80,000 pages. Security: Help ensure the security of confidential information with capability of entering a PIN at the device to retrieve print jobs. Display: Manage your print jobs with ease with the 4.3-inch color touchscreen on the PageWide Pro 577dw. Paper sizes: Tray 1: Letter, oficio, legal, statement, executive, 3 x 5 in, 4 x 6 in, 5 x 7 in, 5 x 8 in, envelopes (No. 10, Monarch); Tray 2: Letter, statement, executive, envelopes (No. 10); Tray 3: Letter, oficio, legal, statement, executive. Choose HP Original cartridges: Use Original HP 972A & HP 972X PageWide cartridges for great results print after print. Save money and change cartridges less frequently with high-yield 972X PageWide cartridges that print up to 10,000 pages. What’s in the box: JD3Q21A HP PageWide Pro 577dw Multifunction Printer; HP 972A Setup Black PageWide Cartridge (~3500 pages); HP 972A Setup Cyan PageWide Cartridge; HP 972A Setup Magenta PageWide Cartridge; HP 972A Setup Yellow PageWide Cartridge (CMY composite ~2000 pages); power cord; phone cord; installation guide; CD-ROMs (for software, Windows and Mac printer drivers, and User's Guide). Media Size Statement - 8.50" x 5.50"; Letter - 8.50" x 11"; Oficio; Legal - 8.50" x 14"; Executive - 10.50" x 7.25"; Monarch Envelope; Envelope No. 10; Custom Size; 3" x 5"; 4" x 8.30"; 8.50" x 11.70"; Photo - 4" x 6"
Minimize interruptions and downtime with efficient, reliable performance. Conserve resources and use less energy than laser printers,4 with HP PageWide Technology designed for today’s busy office. Help protect your fleet, data, and documents with best-in-class security3 and fleet management features. Help secure important information and get the tools you need to work efficiently and confidently. HP PageWide: Not Laser. Not inkjet. It’s the best of both. A new alternative for business printing. EddieB67: The ease of setup and the performance I have so far is excellent. In the first few days of use P rented out over 2500 pages, and the speed and print output was excellent. Super fast, quiet mode keeps wife happy, easy! JDLA1: This machine is great! Super fast, easy to set up, quiet mode is perfect as my home office is close to bedroom. Nothing I don't like about it! Huge fan of the new technology; extremely fast. Lenny53: I read about this new HP technology and I have been pleasantly surprised with the performance. Much quieter than previous HP machines and the printing is lightning fast. No wet ink on page to worry about and the machine is good-looking to boot!!! 2 Comparison of HP PageWide Pro and Enterprise class devices with the majority of in-class color laser MFPs < $3,000 USD, and color laser printers < $1,249 USD as of November 2016; market share as reported by IDC as of Q2 2016. Cost per page (CPP) reported by Gap Intelligence Pricing &2 Promotions report October 2016, comparisons for all supplies are based on published specifications of the manufacturers’ highest-capacity cartridges and page yield. Average yield based on ISO/IEC 24711 and continuous printing. Actual yield varies based on content of printed pages and other factors. For details see http://www.hp.com/go/learnaboutsupplies.